CD23 is the low affinity receptor for IgE. When it appears on eosinophils and macrophages it helps these cells to kill and eat structures that are coated with IgE antibody, but this isn't what it does on CLL cells. Some have suggested that it is a growth factor for B cells, but this is disputed. Others have suggesetd it binds IgE immune complexes and this increases the efficiency of B cell antigen presentation and processing. I can't see why this is important for CLL cells. We also know that it is associated with the fyn tyrosine kinase. It is present on CLL cells, but not usually on other types of B cell lymphoma cells. It is also present in the serum of CLL patients. In continental Europe, particularly Italy, it has been used as a prognostic factor for CLL. It has not traveled. I think the main problem with it is that it is a surrogate marker for both the amount of CLL cells as well as their growth rate, and therefore not particularly useful for predicting the future. This is a simple measurement of how rapidly the CLL is growing. A lymphocyte count doubling every six months is an indication for treatment according to the NCI, though some trials have adopted a less stringent criterion - doubling every 12 months - as an indication for treatment (for example the British CLL4 trial). How accurately does the doubling time reflect the true growth in the size of the leukemic clone? While the count is very low it does not really do so at all. Most of the growth takes place within the bone marrow, and the spillover element in the blood is variable. As the count increases it is more accurate, but it has to be remembered that within the lymphocyte count there is a variable number of T cells and NK cells. Only when the count is fairly high, say over 30k is it safe to neglect this. It is important to exclude the other variables. Strange to say it should not be assumed that different laboratories will give the same answer. Even very famous epartment can get things wrong. The truth is that the famous head of department is usually traveling from meeting to meeting giving presentations or sitting on committees deciding on grants. You can certainly rely on his research laboratory, because the very best people will be competing to work for him (or her), but the routine laboratory in his hospital is unlikely to be under his day to day control. If the laboratory is in a large city, it may be difficult to find laboratory technicians to run the machines - it is not a well paid job, and there are plenty of jobs in the city that are well paid. In one of the tasks I undertook when I was employed by the National Health Service I had to go around inspecting other people's laboratories. I usually got landed with the London Teaching Hospitals. Surprisingly, they were often worse than ordinary laboratories at ordinary hospitals. In one blood transfusion laboratory where the person who had written a well known text book worked, entirely the wrong concentration of suspended red cells was being used. In another, where a well known expert in laborartory technology was in charge, the condensors on the laboratory microscopes couldn't be adjusted because of all the crud on them. So it was no surprise to me when I was sent a sequence of lymphocyte counts which showed an apparent doubling thast was entirely due to a rogue result from a famous laboratory. One technical problem is that the machines are callibrated to give an accurate count in the normal - high range , but when the count is very high it becomes progressively inaccurate. The sample then has to be diluted to get the count back into the accurate range. This dilution introduces a potential source of error. It also has to be remembered that the lymphocyte count goes up an down according to other things than progression of the CLL. Following an infection the lymphocyte count rises as the immune response kicks in. this effect is emphasized by the crowding out of normal lymphocytes from the lymph nodes by the infiltrating CLL cells. Vaccination also induces an immune response, so it can also raise the lymphocyte count transiently. For all these reasons it is important not to accept a single observation as evidence of progression. Unless the count is rising rapidly, I would expect to follow a patients for 3-6 months with several blood tests before being convinced of a rapid lymphocyte doubling time. 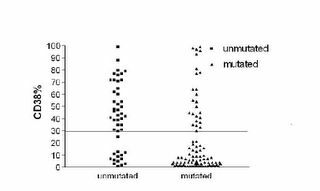 This graph shows the lack of correlation between VH mutations and CD38. About 30% are discordant. One picture is worth a thousand words. This survival curve shows the difference between having mutated and unmutated VH genes. I well remember a meeting in Italy when VH gene mutations were the hot topic. I was in the camp that believed that CLL was frozen in time as a pre-germinal center tumor, with unmutated VH genes. I guess this was based on no stronger evidence than that CLL cells had IgD molecules on their surface. IgD is an unusual form of immunoglobulin, almost only found as a surface molecule and usually at an early stage of differentiation. Several centers had been sequencing the DNA of the immunoglobulin chains in small numbers of patients. Probably the greatest number had been sequenced by Tom Kipps from San Diego, and as an admirer of Tom, I was plaesed to see that his findings fitted with my prejudices. Guillaume Dighiero from Paris and Harry Schroeder from the US had assembled all the published case reports of CLLs with VH gene sequences. They found 76 and much to my surprise half of them had mutated VH genes. I scrutinised these cases carefully and was very dubious. Several of the mutated cases had been reported by Nick Chiorazzi from North Shore, Long Island, and had surface IgG rather than IgM+D. This is unusual in CLL and since class switching from M to G is a germinal center task it was natural that such cases should be mutated, another germinal center task. Other cases were clearly not CLL, being CD5 negative and still others had serum paraproteins, an unusual finding in CLL. The way we got into VH gene sequencing was like this. Martin Glennie had been raising anti-idiotype antibodies against lymphomas as part of our lymphoma therapy protocol. One of these antibodies, 9G4, proved of no value as a therapy because it cross reacted with other antibodies. The patient happened to make a cold agglutinin and Freda Stevenson had the idea that 9G4 might cross-react with all cold aglutinins. Cold agglutinins had been an interest of mine since I was a juior doctor. I should expplain that cold agglutinins are IgM antibodies that are present in everybody's blood at low concentrations, that bind to red blood cells in the cold and cause them to stick together. In certain circumstances high levels of cold agglutinins are found in the blood - after infection with mycoplasma pneumoniae or EB virus, and in some elderly people where the antibody is monoclonal, and in some lymphomas where it is made by the tumor. So we set about collecting all the cold agglutinin specimens we could find. We produced cell lines that secreted cold agglutinins. It turned out to be true. All cold agglutinins reacted with 9G4. We then sent the cell lines to America to have the immunoglobulin genes sequenced. This demonstrated that all cold agglutinins used the same VH gene. It was then known as V4-21 but has now been renamed as V4-34. It soon became clear that we could not continue this research with someone doing the sequencing for us so we had to learn to do it ourselves. Doing it by hand is a tedious time-consuming business so I was able to raise some money to buy a machine to automate it. Freda Stevenson and David Oscier looked at 20 CLLs and sure enough found that both mutated and unmutated V genes were present. The striking finding was that the mutated cases had the del 13q14 chromosomal abnormality while the unmutated one had trisomy 12. 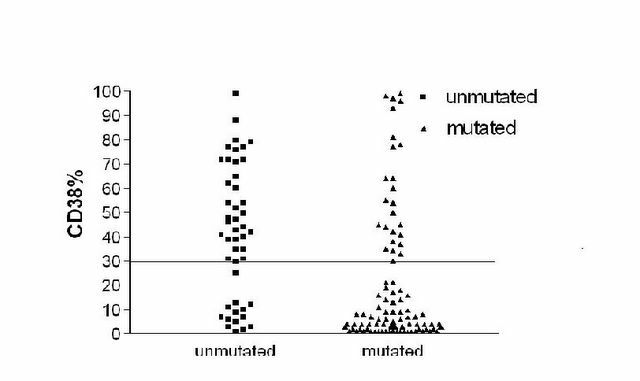 This made us suspicious that the more benign cases were mutated, and to test this I collected another 64 cases. Now that we had large numbers, there was no doubt about it; the mutated cases had an average survival of 25 years and the unmutated cases only 8 years. I presented these data in 1997 and 1998 at the British Society for Haematology, the IWCLL and the ASH meetings. Nick Chiorazzi heard the presentation at the IWCLL. He had sequences on 64 cases and correlated their survival with the VH gene status and found exactly the same as we had. He also found that CD38 expression gave very similar results. We decided to publish the papers together as being mutually confirmatory. Following this paper the value of VH gene mutational status has been confirmed several times by the French, Germans, and Swedes in particular. The B cell receptor is what makes a B cell a B cell. It's main component is the immunoglobulin molecule that it is programmed to make. It's like a label on the surface of the cell that says, "This is what I make." Back in the 1960s I though that antibodies were made to order, formed around the template of antigen. I well remember the lecture by John Verrier Jones who scotched this idea. He started by explaining how diverse was the immune response. Millions of different antibodies were requred. Yet it was improbably specific. A slight change in shape would mean that the antibody would no longer react with the antigen. Surely every antibody must be made individually; built to the specifications of the antigen. But No. This is not how nature works. The usual method is to make every possible shape and select from these. Survival of the fittest is standard practice. The objection is that to produce every possible antibody requires more information than is present in the DNA. As John put it, "The information required would take up 44 chromosomes with only 2 left for all the other things the body needs to do." The answer is mix and match. In the human there are 5 genes that code for the buiness end of the antibody - the end that combines with the antigen. The antibody molecule consists of 4 polypeptide chains (that means 4 chains made up of a sequence of amino acids). There are 2 identical light chains and 2 identical heavy chains. For the heavy chains the chains are Variable (VH) Joining (JH) and Diversity (D), while for the light chain there are Variable (VL) and Joining (JL). In order to obtain variation the chromosomes contain many different copies of these genes, all slightly different. So there are 51 different VH genes, 6 different JH genes and 27 different D genes. Something similar exists for the lightchain. 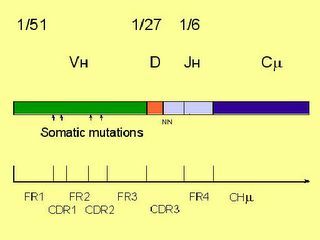 Every time a new lymphocyte is born it selects one of the 51 VH genes, one of the 6 JH genes and one of the 27 D genes. Thus it decides to use only one of the 8262 possible combinations. It is even more complicated than that. The junction between V and D and D and J is imprecise. It is like my carpentry. When I make a joint, sometimes there is a gap and I have to add filler to fill it; sometimes the fit is too tight and I have to plane a bit off to make the fit. The same is true with the immunoiglobulin genes sometimes the cellneedes to add filler, sometimes to plane a bit off. To explain how this works we have to understand the DNA code. DNA is like a spiral staircase. The bannisters are made up from the sugar backbone; the steps from the nucleotide bases. In DNA there are 4 types of nucleotide: Guanine (G), Thymidine (T), Cytosine (C) and Adenine (A). In forming the steps C always pairs with G and A always pairs with T. This makes copying easy because if the two halves of the chain come apart as they do in cell division, each acts as a template for the construction of the complementary chain. The DNA is translated into protein, which is made up of chains of amino acids. In the DNA a sequence of three nucleotides is called a triplet. There are 64 possible triplets and 20 possible amino acids. Some amino acids are coded for by 4 triplets and some by 2, while one triplet codes for 'start copying' and one for 'stop copying'. Thus GCU codes for alanine, AGC for serine, UGC for cystine, GAC for aspartic acid, CUG for leucine, AUG for methionine etc. When extra filler nucleotides are added it changes the whole sequence. These are called frame shifts: obviously any sequence of nucleotides can be read in any of 3 frames. It means that the number of possibles is now multiplied by 3 up to over 24,000, plus the extra nucleotides are not limited to one or two but may be many: it could be very bad carpentry. When the light chain possibilities are added in we are up into the millions. There is even more refinement to come. The usual thing is for antigen to select out the BCR that fits it best and to take it along to the nearest germinal center where antigen and antibody start canoodling. The B cell reacts by dividing and each time it does so it makes a subtle variation in the BCR by a small number of point mutations. These are called somatic mutations. Some of these will make the antibody a dreadful fit for the antigen: such cells are executed by apoptosis. But some will be a better fit, and by such selective breeding the dog with just the right length of tail is produced. Thus the best antibody for any immune response is made. Natural history is a bit of medical jargon. It means what happens if the disease is left to itself without treatment. For CLL this is very variable. Some people who are diagnosed with CLL continue to have a raised white cell count, but never develop enlarged lymph nodes or spleen; never develop anemia, neutropenia or thrombocytopenia; never get ill. They die at 105 of something else. Some people already have large lymph nodes that get bigger, a large spleen that becomes enormous; are anemic making them short of breath, neutropenic so that they catch pneumonia and are thrombocytopenic and bruising easily or bleeding uncontrollably. And in between almost every variation occurs. Lymph node enlargement is mainly very superficial. In the neck, groin and armpits the nodes are easlily felt. They tend to be multiple, not painful or tender, quite soft and rubbery and of sizes varying from a small pea to a quail's egg. (How many have seen a quail's egg? If you saw the TV production of Brideshead Revisited you will remember that Sebastian served a huge plate of quail's eggs in his rooms at Oxford. The spleen enlarges from under the left ribcage. I have only once seen it go past the umbillicus. The anemia is normochromic, normocytic. That means the red cells are of a normal color and normal size. Severe anemia is unusual and makes one think of autoimmunity. Autoimmune hemolytic anemia (AIHA) occurs in between 10 and 20% of cases (depending on which paper you read). CLL is actually the commonest known cause of AIHA, acounting for about 25% of cases. An antibody is produced directed against the patient's own red blood cells. It is not made by the CLL cells themselves but by the residual normal B cells. The antibody latches on to the red cells and fixes complement. Complement is a cascade of blood proteins that react one with another from C1 to C9. C9 provides the killer blow and punches a hole in the red cell. However, in AIHA realted to CLL the activation of complement seldom goes beyond C3. C3 makes red cells more attractive to macrophages and as the blood circulates through the spleen the red cells get snaffled by the macrophages there. Immune thrombocytopenic purpura (ITP) occurs in between 1 and 2% of cases. Again it is cause by an autoantibody. Platelets coated by antibody also get snaffled by the spleen. Pure red cell aplasia may be an autoimmune disease directed against the red cell precursors so that no red cells are made by the bone marrow. However, it may be that the mere presence of large numbers of CLL cells in the bone marrow is enough to inhibit red cells from growing there. Most patients with CLL get immunodeficient. The most obvious manifestation of this is the fall in the serum imunoglobulins. The fall is greatest in those who have had it the longest and in the greatest bulk. Patients suffer from sinus infections and pneumonia. Between a quarter and a third get shingles. One week to Christmas. Still no snow. It was very cold this morning, frost on the ground, ice on the windows, but by this evening it is muggy and damp again. Carols this morning in church. New carols. Graham Kendrick carols. I am working my way through my 29 CDs of Christmas songs and carols. From "A lonely pup in a Christmas shop" to Poulenc and Britten. I love them all. My favorites? O Holy Night. Driving home for Christmas. Hark the Herald Angels Sing. The Pogues. I think it was "Home Alone" that started the extravagent house decoration in the UK. It is a pleasure to drive around the streets at night trying to find the house decorated in the most extreme bad taste. I don't look down on them. They give me joy. I rejoice in the exuberance of it all. All these CD numbers are confusing. It has nothing to do with compact discs. CD stands for clusters of differentiation. In the 1980s laboratories began to make monoclonal antibodies against blood cells. At that time nobody had any idea how complex was the surface of the lymphocyte. It soon became clear that some antibodies reacted with some lymphocytes and some reacted with others. It was very confusing. We had known about T and B lymphocytes since the early 1970s. B lymphocytes had immunoglobulin molecules on their surface. T lymphocytes bound tightly to sheep red blood cells. Why anybody should have mixed lymphocytes with sheep blood cells seems a mystery now, but at the time a small industry came into being mixing blood cells from various types of animals with human lymphocytes. Scientists were raiding zoos for the most exotic species. I remember that we kept an ox at a local farm to provide us with red cells for certain experiments. CLL was strange; it was certainly a B cell since it had immunoglobulin on its surface (though only about 10% as much as other B cells) but it also reacted with red blood cells, not from the sheep but from the mouse. To solve the mystery workshops were held where people with monoclonal antibodies took them along and reacted them with various populations of white cells. Antibodies that seemed to have similar reactivity were placed in a particular "cluster of differentiation" and given a CD number. Where there were not enough different antibodies of a particular type, a provisional "workshop" number was given. Thus the antibody called B1 by the Boston workers became CD20 because there were several similar antibodies. There were several anti-B cell antibodies recognised at that time and they were given successive numbers: CD19, CD20, CD21, CD22, CD23 and CD24. 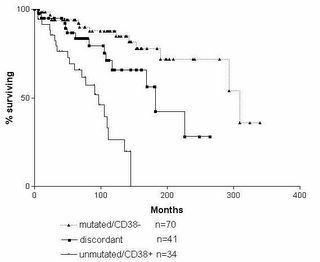 In the same way the earliest anti-T cell antibodies were given the numbers CD1 through to CD8. Campath was unique; it was given the number CDw52 and only later was it allowed to drop the w.
The eighth workshop was held this year and we are now up to 239 CD numbers. Some have suggested that there may be as many as 5000 different proteins on the surface of lymphocytes so who knows where the process will end? Immunophenotyping is the process by which a cell can be identified by listing the different antibodies that react with it. It used to be done by fluorescence microscopy. A cell was reacted with an antibody that had been labelled with a fluorescent dye. Under the microscope the dye was excited with ultra-violet light to make it glow bright green, and so label the cells that it reacted with. These days it is all done much more quickly, accurately, sensitively and quantitatively with a flow cytometer. It is not necessary to list all the antibodies that a type of cell reacts with, only the ones that give it a distinct pattern. 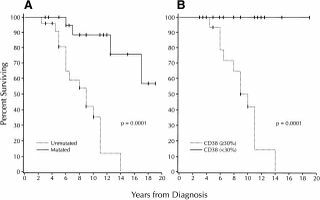 For CLL the pattern is CD5, CD19, CD20, CD23 positive, weakly positive for surface immunoglobulin and CD79b, and negative for FMC7. 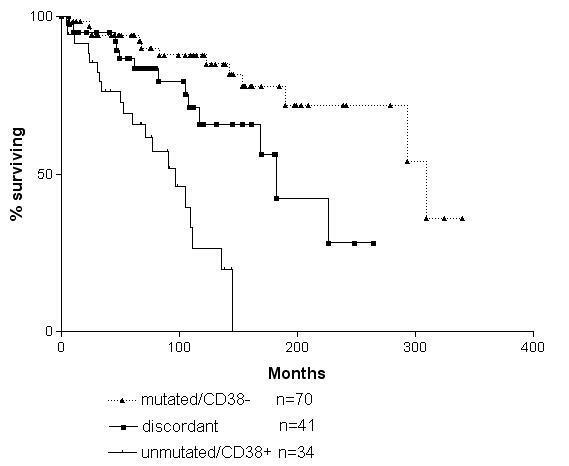 CD5 is expressed on all mature T cells, but not normally on B cells. Its presence on CLL cells is therefore unexpected. It is also present on the cells of mantle cell lymphoma and these two conditions are frequently confused. I shall dicuss this problem in a later blog. There is also a population of normal CD5 positive B cells. In the mouse these live in the peritoneal cavity and are rather special. They are known as B1 cells. In the human CD5 positive cells are present in the follicular mantle of the lymph node and in cord blood. In tissue culture CD5 negative B cells can be induced to express CD5 after certain types of activation. The question of whether CLL is a tumor of B1 cells or whether CD5 is simply an activation marker on CLL is controversial. I will write about it on another occasion. 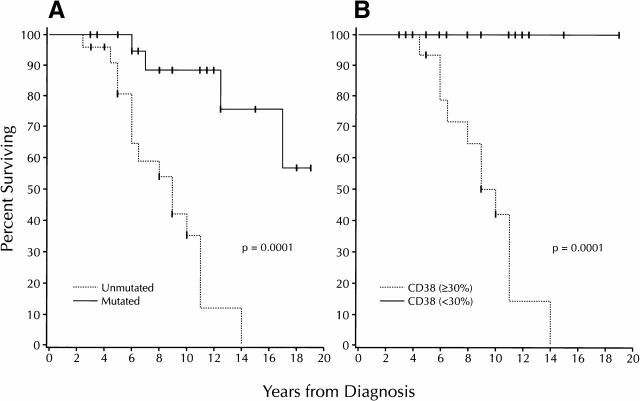 CD19 is a marker present on all B cells and in some circumstances is involved in signaling through the surface immunoglobulin. CD20 is present only on B cells. On CLL cells it is more weakly expressed than on other B cells. It is now clear that FMC7 recognises part of the CD20 molecule, but this part is hidden by lipid in most CLL cells so that FMC7 is usually negative in CLL and the CD20 is weaker than normal. CD23 is one of the receptors for IgE. It is usually undetectable in B cells except for CLL, but it is also present on monocytes and eosinophils. CD79b is one of the immunoglobulin associated molecules. It is through this molecule that stimulation of the surgace immunoglobulin sends a signal to the inside of the cell. Immunophenotyping has enabled us to recognise CLL cells when there are only a few present. It has therefore reduced the threshold for diagnosis of CLL from 15,000 lymphocytes to 5000. It has helped us to distinguish CLL from several imposters including splenic lymphoma with villous lymphocytes, mantle cell lymphoma and marginal zone lymphoma. Are you ready for Christmas? This year I am early. I have finished my Christmas shopping and wrapped all the presents. I have filled stockings for my children (aged 25 and 28). I have decorated the Christmas tree. My wife has ordered the turkey and baked the Christmas cake. At various times over the holiday we shall have visits from all four children and all five grandchildren. We shall visit my mother and my father-in-law and see all my siblings. I doubt it will snow. It seldom does in Bournemouth. I hope it will be crisp and sunny - if not it will be warm, wet and windy. That's how the weather alternates in this part of the world. I have seen an argument that Jesus Christ was born on 25th September in 6BC. It is calculated on when Zechariah, the father of John the Baptist, took his turn in serving in the Temple and the fact that Herod the Great died in 4BC. The early church was given to syncretism and simply adopted a pagan midwinter festival. I used to scoff at the artifice of Christmas. Jolly old Santa has escaped from a Coca-Cola advert. The Christmas tree was instituted by Prince Albert. Christmas Cards were simply a piece of Victorian public relations. Oliver Cromwell abolished Christmas as a pagan rite. But now I realise that Christmas is very special. It may be sentimental but so what? The 25th of December is not the date of Christ's birthday, but as a symbol it is very powerful. It is the darkest time of the year when the night is longest. As the Bible says, "... at just the right time ... while we were still in our sin God sent his son". This is my Christmas Carol. It may be sung to the tune of the "Ode to Joy" from Beethoven's 9th symphony. God is as a baby born. See him set his glory by. Born a man; for men to die. Was conceived a mighty plan. God should die instead of Man. O what grace, what condescension! Through the world his great love tell! See how shepherds come and worship! Far outshining moon or star. Let the whole creation praise him! Almost every review begins "CLL is the commonest leukemia in the western world". I wonder who first wrote that sentence? And is it true? Traditionally, it is believed that the great German pathologist Rudolf Virchow coined the term leukemia. It just means white blood. In fact the first description of leukemia (and I shall stick to the American spelling because it saves a key stroke) was by John Hughes Bennett, the Englishman who was Professor of Medicine at Edinburgh, a Scottish University, and who beat Virchow to the punch by 6 weeks. You can actually trace an even earlier case of what was probably leukemia from the writings of the Parisian doctor, Armand Velpeau, eighteen years earlier in 1827. Both Virchow and Bennett studied in Paris before they made their discoveries. There are lots of causes of increased white cells in the blood that are not leukemia. What makes a leukemia is the fact all the cells are the children of a single parent. They are monoclonal - genetically identical members of the same clone. In CLL they are also lymphocytes. A lymphocyte is one of the 5 types of white blood cell (the others are monocyte, neutrophil, eosinophil and basophil). Lymphocytes are members of the immune system and are further subdivided into T cells (derived from the Thymus), B cells (derived from the Bone marrow) and NK cells (it stands for Natural Killer). CLL cells are B-lymphocytes. CLL is sometimes called a tumor of B cells, but that is confusing because tumor means swelling and not every case of CLL has a swelling. It's medical shorthand for a growth. When I trained, doctors went in for euphemisms a lot. Instead of calling something a cancer it was called a growth or a neoplasm or a tumor or a mitotic lesion, or just a lesion. It is not simply a matter of avoiding telling the patient the truth; there is also the matter of precision. To most doctors cancer is the lay-term for carcinoma. Cancer is Latin for a crab - it is one of the signs of the Zodiac. Carcinoma is Greek for crab. The Patricians speak Greek; the Plebians talk Latin. A carcinoma is a malignant neoplasm of epithelial tissue. Blood is not an epithelial tissue, so we get uncomfortable when patients talk about a cancer of the blood. Neoplasm just means newly formed or moulded or grown (Greek again). So in lay terms a neoplasm is a new growth. It isn't necessary cancer; it could be a benign (good) or a malignant (nasty) growth. A lesion refers to any kind of tissue damage (it comes from the Latin for hurt). A mitotic lesion is one that is characterised by mitoses. Mitosis is the mechanism by which cells duplicate their chromosomes and divide, so a mitotic lesion is a hurt in which cell division is prominent - in other words a cancer. Strictly speaking leukemias should be called sarcomas. A sarcoma is a malignant growth of a non-epithelial tissue. Epthelial tissue is what covers the outside of the body. But you have to remember that the lining of the gut is the outside of the body; outside but inside if you see what I mean. We used to have the term lymphosarcoma. This was another term coined by Virchow. In the Bible we read of God bringing all the animals to Adam in the Garden of Eden for him to give them names. Virchow was very like Adam, very good at naming things. Lymphosarcoma became to be used for a particular form of neoplasm of lymphocytes and is now no longer used. W use the term lymphoma instead to refer to neoplasms of lymphocytes and strictly speaking CLL is a form of lymphoma, though by convention we call liquid tumors leukemias and solid tumors lymphomas. When CLL is mainly solid it is known as small lymphocytic lymphoma or SLL. Often patients talk of having CLL/SLL. That usually means that they have seen an oncologist who is more comfortable dealing with lymphomas than leukemias. "Chronic" is also from the Greek and has to do with time. We talk about Acute leukemias which happen quickly and Chronic leukemias that happen slowly. So CLL is the slow malignant growth of one of the white blood cells - the one known as a B-lymphocyte that should have been in the business of making antibodies. The main purpose of this blog is to be a source of information for patients with chronic lymphocytic leukemia (CLL). In writing about this disease I shall let slip some things about myself. Can't be helped - and since it can't be helped I shall do it deliberately. First: about the title. It is, of course, a play on the title of Wordsworth's famous poem "Intimations of Immortality". An early line from this long poem states, "The things which I have seen I now can see no more". This is a motive for writing. These days unless I write down what I think, I forget what I was thinking about. Whether it is worth remembering is for others to judge. 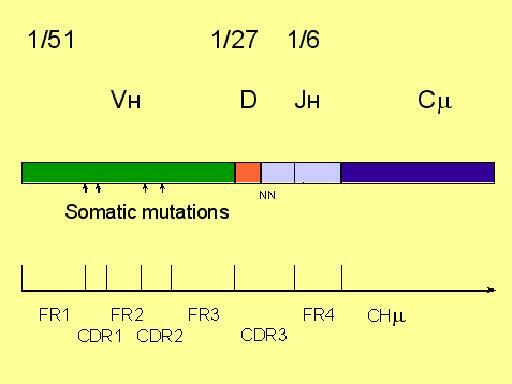 "Mutations" refers to the most significant piece of work I have done on CLL: the discovery that the mutational status of the immunoglobulin genes is the most important prognostic factor in this disease. But mutations are also changes, and changes are things that I will reflect on in this blog. One of Wordsworth's sonnets is entitled "Mutability" but his changes are all at the behest of the second law of thermodynamics: "entropy increases" or the housewife's version "things wear out". Change for Wordsworth is always an inability to sustain "the unimaginable touch of time". Are all changes for the worse? This we will discover as we read on. Mortality comes to us all as long as (as they used to say) the Lord tarries. But not to CLL cells. 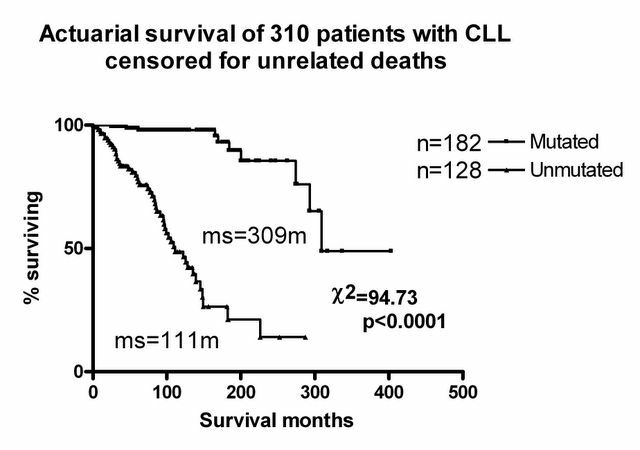 A signal characteristic of the CLL cell is its immortality. Or in scientific-speak, its failure of apoptosis. 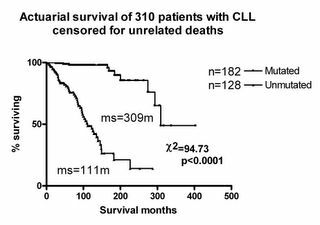 I used to joke that having CLL was a guarantee of immortality. What I meant was that by an large it is a disease of the old, and if you happen to have the mutated version the disease didn't kill you. 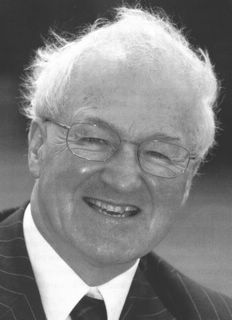 Many of my patients were in their nineties and some were over a hundred. So perhaps it should be "Mutations of Immortality"? I experimented with this but I liked the alliteration and I wanted eventually to write about the problems of dying. The word "leukemia" leaks terror in the staunchest chest. But this leukemia kills by stealth not strength. It hangs around for years and sometimes for decades. There is time to consider one's own mortality. And we have time.